Winter has not gotten the best of me yet and I plan to stay positive until the first daffodil pops its head out of the ground. I miss my garden blooms greatly, but having photographs makes the world of difference, and in reality, I only need close my eyes for a stroll through our garden. The only thing missing is the scents. We are currently Grand Central Station for the birds so gardening for wildlife has paid off. We have enough cover and wildness to qualify as great bird habitat. 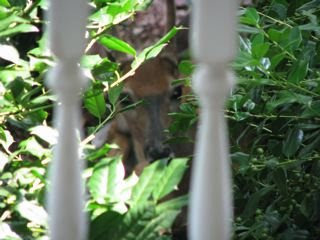 Even a deer enjoyed the area beside the porch for afternoon naps this past summer. Since we've developed quite the wildlife habitat here at our home in Virginia, which we considered to be a temporary residence, the hard part of leaving, when the time comes, will be to let go of the garden. There are several reasons this location doesn't "fit" but we felt while we were here we wanted to improve it as much as we could. 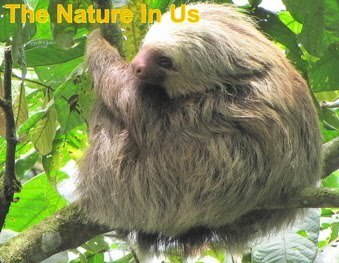 Natural habitats are being destroyed around the world, so if we create more backyard habitats, we'll be doing a great thing for the other creatures that share our planet. We have wonderful neighbors, so that's another reason we're still here. We've never lived anywhere with bad neighbors, but we've also not lived anywhere that's been this great. Maybe because most of us are home all day, it makes for more time to enjoy people. Too bad life doesn't always allow people to be a priority ... or is it the choices we make that makes life that way? Hmm ... that's another topic. One of my neighbors, Ken Bushell, loves wildlife photography as I do, so it's been fun to share that common ground. I've mentioned him before and you may have seen some of his photos on this website. One day he offered to paint a picture for us of our place from photographs. At first thought I didn't care about having a picture of our home. It was/is the garden that we love and will miss seeing, so later I asked if it could be a picture of the garden. What I visualize the most is when I head out the front door and off the porch to the walkway garden. That's my "image" of our place here that we fondly call Bluebird Cove. Ken is quite the fascinating guy and always up for a challenge! After retiring from an engineering position he went back to a childhood hobby .... painting. However, as you can see from this painting, it's not really a hobby, it's a talent! He felt all the greens and diversity of a garden might be more than he could handle, but wanted to give it a try. With his wife, Yvonne, the constant critic and angelic voice behind him, he did an amazing job. Randal and I have been enthralled with the image being put on canvas. Fortunately he did not make it as wild as reality ... some friends call it the jungle. With the plants a bit subdued he got a real feel for the house (porch) and even the beautiful Butterfly Bench that has brought such meaning to the garden. What a thoughtful gift and one that we will treasure even more after we've left here. For now, it hangs above the fireplace and is a daily reminder of not only the garden ... but also of the importance and treasure of having wonderful people to share your life with. This winter instead of thinking about arthritis and dreary weather, I'm focusing on the warmth of friendship. Creating art is like making something magical happen. Maybe because I would need a miracle to draw more than a stick man on paper. There's something precious about a "living" scene on canvas. I have often wished I had a painting or at least sketch of our home in Alabama that we called "The Refuge." We were so buried into the woods that you couldn't see much of the house from any camera angle. 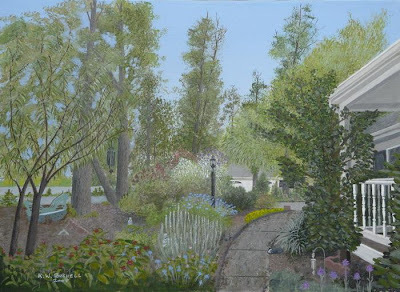 Ken has done many paintings since getting back to it and he's recently put them on a website. Visit Ken's Art website. If you'd like to have him paint something you see there or something from photographs, send him an email. His email address is on the home page. What Breathes With Its Feet? Don't Want To Eat Greens? What Does A Cat's Purr Mean?